Final results are in for the EasyCare $10,000 Hoof Boot Contest. Total miles ridden in the 2008 contest totaled 16,726. See full contest results here. 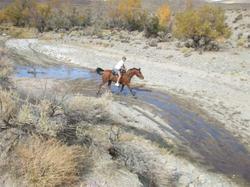 Congrats to Terri Tinkham and her wonderful horse Oliver Twist for an incredible 1,925 miles ridden. An incredible accomplishment for both horse and rider. Natalie Herman had an impressive year with 1,440 miles ridden in EasyCare hoof boots. The contest shows that horses wearing hoof boots can not only compete but they can compete at the highest levels of equine sports. Booted horses are now competing side by side with shod horses without raising eyebrows. It's becoming common place. The top ten riders with money earned are listed below. We had a tie for 10th place and decided to pay both. 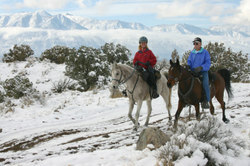 Pictured on the right is Second Place Winner Natalie Herman and her horse Cheyenne. Exciting changes are coming for the 2009 contest. New hoof boots and new incentives. Full contest details will be posted soon. I'm working out the details for the EasyCare 2009 Hoof Boot Contest. Although the overall concept will be very similar to the 2008 Hoof Boot Contest I'm thinking of adding the following changes. 2. Bonus monthly payouts for each mile over 200 miles. Let me know if you have ideas for the 2009 contest. In addition to the hoof boot changes EasyCare is looking to partner with 1-2 riders in each AERC region. We are looking for riders that plan to do 500+ yearly miles and have a good grasp of hoof boots and hoof boot fitting techniques. We have 4 new hoof boots that will hit the market in 2009 and the selected regional riders will help EasyCare introduce the new designs in their region. EasyCare will compensate the selected riders. If you have any interest please respond. Three riders in AERC top ten for 2007! Big news for EasyCare, hoof boots, barefoot and AERC. The AERC National Mileage Championship is complete for 2007. Three of the top ten riders in the AERC National Mileage Championship used EasyCare hoof boots to complete the amazing mileage totals. In addition to these riders placing well in their respective AERC divisions they were #1, #2 and #3 ranked in the $10,000 EasyCare Hoof Boot Contest. 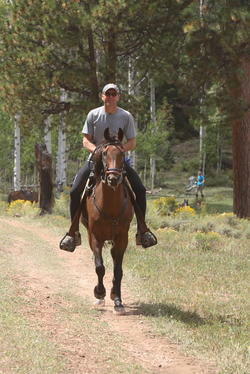 Karen Chaton and Granite Chief were ranked #6 in the National Mileage Championship with 1,370 miles. Karen now has 20,910 AERC miles and the majority of those miles have been ridden in EasyCare hoof boots. As many people are aware, Karen is now part of the EasyCare team and an incredible asset to the company! Karen is pictured below with Dave Rabe. Dave Rabe and Lightening Strike logged 1,120 for the 2007 season and were ranked #10 in the National Mileage Championship. Dave won the $10,000 EasyCare Hoof Boot contest with 1,625 miles. Dave is pictured with Karen below. Terri Tinkham and her nice Tennessee Walking horse Oliver Twist ended the 2007 season with 1,120 and in a tie for 10th place in the National Mileage Championship. Terri was 2nd in the $10,000 Hoof Boot Contest with 1,170 miles. Terri is pictured below logging some of her hard earned miles in rough conditions. Easyboots were also part of Karl Phaler's success in 2007. Karl and Bubba placed 3rd in the National Mileage Championship with 1,650 miles. The 2007 EasyCare $10,000 Hoof Boot Contest is just about over. The contest was a huge success and we believe it will be even bigger in 2008. Here are a couple highlights from 2007. 1. 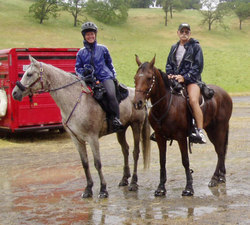 The number of participants increased from 19 horse and rider teams in 2006 to 81 horse and rider teams in 2007. 2. 18,911 miles were completed by contest riders in 2007 compared to 8,283 miles ridden by contest riders in 2006. 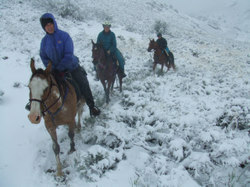 In 2005 contest riders logged 8,640 miles. In three short years contest riders have accumulated 35,834 miles! 3. 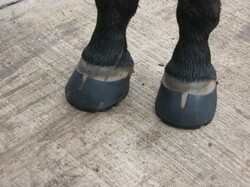 All 35,834 miles were completed using EasyCare hoof boots. The majority of the contest miles have been accomplished using the Easyboot Epic. Hope you can join the contest for 2008. Click here for details. The EasyCare $10,000 Hoof Boot Contest continues to build momentum and the contest is now over 140 riders strong, with over 75 recording mileage. To date the contestants have logged over 16,000 miles in various EasyCare hoof boots. Click here to learn more. I was actually the 75th rider to complete miles in the contest and have 100 miles on Cyclone and Spyder. If all goes well I'll try and fit in a couple more endurance competitions before year end.